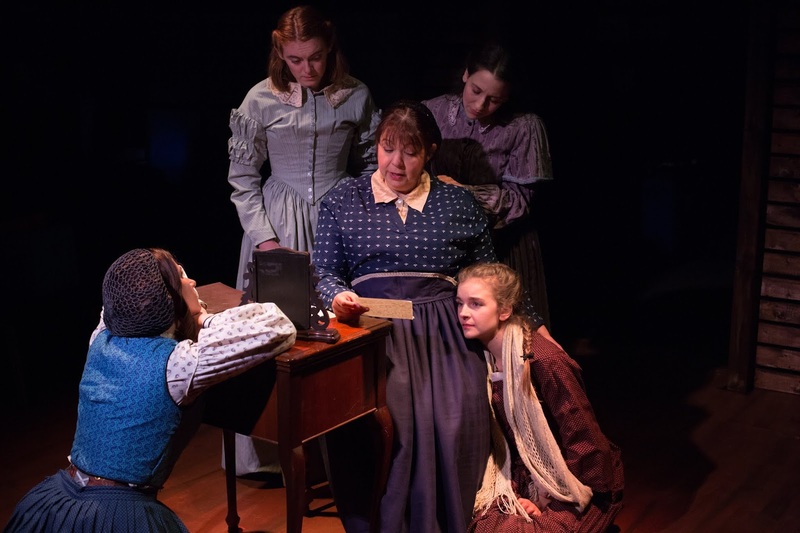 Once upon a time I went to a show and it was called Little Women. The music was by Jason Howland, the lyrics were by Mindi Dickstein, and the book was by Allan Knee based on the novel by Louisa May Alcott. It was directed by Stephanie Rohr and M. William Panek. It was about the March sisters--Jo (Tessa Dettman), Meg (Andi Sharavsky), Amy (Kim Green), and Beth (Sarah Ford)--who lived in Massachusetts during the Civil War. It is about family, growing up, and ambition. I thought this was a fun show. I think it is an adaptation of a great story that is mostly true to the book. The music at points wasn't very interesting to me, but it was well performed. I think the romantic relationships in this production were very specific and effective despite the relationships being underwritten. I think that is a sign of really great actors when they can take a relationship that is given little to no attention by the script and make it seem vital. 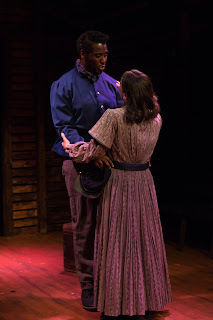 Meg and John Brooke (Dwayne Everett) had an adorable and effective relationship, even though we didn't get to see their courtship develop very much on stage. They only have one song, "More Than I Am," together but it means a lot and it shows us how devoted John Brooke is going to be to Meg. Even though you only get to see them talk together for a short time, you see how vulnerable they can be with each other. That is very important and they have a very prosperous marriage. The relationship between Jo and Professor Bhaer (Matthew Fayfer) is very sweet and unexpected, but they seem to work very well together. They have this adorable flirtatious scene right before Jo goes back to tend to Beth, which leaves you on a cliffhanger about what is going to happen with them. They are ok with disagreeing, in fact it gives them purpose. In the song "A "Small Umbrella in the Rain" they talk about how they disagree a lot and they may not be super similar but they work well together and love each other and that should be enough. I was rooting for this relationship the most because they both are sort of odd ducks and it is nice to see people who are outsiders find each other. Bhaer doesn't want to change Jo; he wants someone who has strong opinions and ambition. The relationship between Beth and Jo seems quite underdeveloped in the script, as well, but the actors seemed to create that context for themselves. Because they developed this relationship, it makes Beth's death even more heartbreaking. I really dislike the song that they sing during Beth's goodbye, "Some Things Are Meant to Be," but their acting made up for it throughout this scene because Jo was so scared for Beth and they both love each other a lot. You haven't really seen their love that much before, but you believe it has been there the whole time. I feel like everything in the performance of the song seemed genuine despite the lyrics that were simplistic and unnecessary. I feel like the performers did a phenomenal jobs because I was almost moved to tears despite my dislike of the lyrics. Jo has a song called "Astonishing" which is about how Jo thinks that she could be known and loved for writing and doing what she loves as long as she puts enough work into it and keeps going even though she keeps being denied. It is sung beautifully and has some really well sung high notes. I feel it is the most memorable song in the show. We also see a lot of Jo's ambition in her storytelling which is very dramatic and over-the-top. The actors who play her sisters, Marmie (Denise Tamburino), Brooke, Mr. Laurence (Ken Rubenstein), and Laurie reenact her words around her in a very melodramatic way. Jo eventually learns that being authentic is more interesting than creating a new universe. If everything is over-the-top and there is no clear reason why anything is happening, you have fewer points of connection to the story. The melodramatic stories are very stage appropriate and funny. Jo feels immersed in them and her family and friends perform them with gusto, which shows that she shouldn't be writing about Clarissa, Rodrigo, and a Troll, but instead about the people who support her and take joy and her stories. And that is what she does with Little Women. People who would like this show are people who like healthy argumentative relationships, great actors filling in gaps, and ambitious little women. I think people should go see this show. It has a lot of really good performances and the cast works really well together. I liked it.